Disclosure: This post was sponsored by Global Influence. All opinions expressed are my own. The season for holiday cards is quickly approaching! I used to spend a ton of time thinking about the cards I was sending out each year, but very little time worrying about what to do with the cards we received in return from family and friends. Then, a few years back, I found inspiration for a simple holiday card display from (where else?) Pinterest and I've never looked back! The problem I always encountered was the number of cards. For the first couple years of our married life, we tried sticking them on our fridge, but it quickly got to the point where there were three layers of cards and they all fell off anytime someone moved, breathed, or (heaven forbid) opened the freezer door. I was hesitant to go with a basket or box for storage during the holiday season, because I wanted to enjoy each card over and over again! This idea is very simple and you only need two supplies: a big roll of holiday-themed ribbon and some clothespins (you could easily DIY those as well to make them glittery or patterned or generally more Christmas-themed, but I haven't gotten around to that yet). Take the ribbon and loop it all the way around your kitchen cabinet doors, tying a knot in the back. You can cut it and use Duck Tape to hold it to the back of the cabinet as well, but after six weeks of holding up cards, the stickiness of the tape wears off and cards and ribbon may start falling into your food as you prep for New Year's Eve. I may or may not know this from experience. 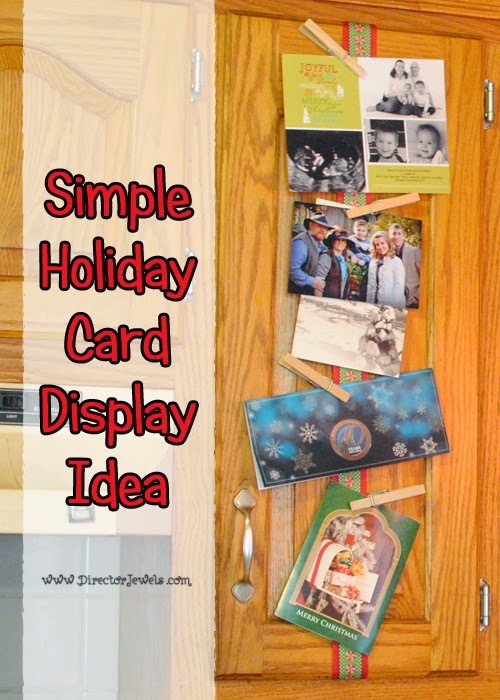 Depending on how many cabinets you have (and how wide they are), you can probably display an impressive amount of cards in a festive way - without taking up any other wall space! During the holidays, the stuff in my home seems to increase exponentially so I try to keep it all as contained as possible. And that's it! Told you it was easy! 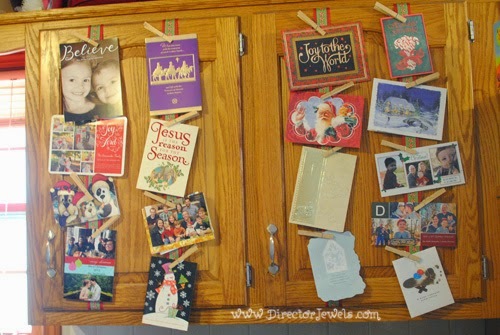 Do you display the Christmas cards you receive? Tell me your best organization idea for the holidays! This post was inspired by Paper Culture known for their eco-friendly Christmas and Holiday Cards. Pretty neat, I stick my cards in the blinds, but now that so many people send out photo cards that doesn't work well. I love being able to see all the photo cards - that's why I love this decoration idea! I love this idea! Thanks so much! Very excited to do this. The last picture with all cabinets and windows is our exact same setup and look. Weird. You're very welcome - I hope it works well for you! It definitely will work! I've never had a place to display them. Just wanted to let you know that I did display them! I used 3 cabinets and probably could have used a fourth! Don't know how to post a pic. Thanks again! I look forward to this every year now! Happy New Year! It's one of the greatest ideas, isn't it? So convenient.